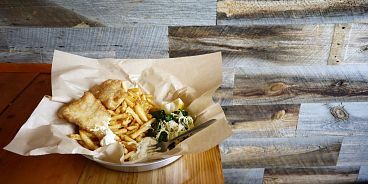 Does The Fish Counter Make The Best Fish & Chips in Vancouver? In case you haven’t already discovered fish and chip heaven (also known as The Fish Counter on Main Street), let me tell you: I don’t remember ever tasting fish and chips this good. And, I ordered the gluten free batter. So I can’t even imagine what the regular version tastes like. Your fish options are halibut, wild salmon, ling cod and pacific cod — all ocean wise of course. Because sustainability is what The Fish Counter and its owners Chef Rob Clark and Marine Biologist Mike McDermid are all about. Their perfectly fried fish is served with a deliciously light cole slaw and hot fries which you can douse in malt vinegar, if you like. Other menu items include crispy cod tacos, made with Dona Cata’s renowned corn tortillas, sandwiches (like oyster po boys and dungeness crab and shrimp baguettes) and a dairy free clam chowder, which is thickened with potato. The Fish Counter, located at 3825 Main Street, is also a perfect spot to grab picnic fixings — they sell salads by weight, salmon candy and their meals are available to go.